Why IOER, oh why IOER, oh why IOER, did I ever do IOER? Why would you deliberately set out on a path to a goal only to deliberately tie a rope to the start point and tie yourself to the rope? The Interest on Excess Reserves (IOER) question is a bit like that. Frances Coppola expresses the smart view on the issue here, but it is all a fuss about nothing. Looking at JP Morgan’s (JPM) balance sheet (from the 10K, p .314) for 2014 you see an average balance of “Deposits with Banks” of US deposits of $328 billion. It earns 25 basis points of interest (0.25%), or $825 million. All the $328 billion is with the Fed. The question is, what would happen if that 25 basis points of Interest on Excess Reserves went to zero? For a start JPM would lose $825 million of gross interest income. Not a huge deal for JPM given its $44,619 million of of gross interest income less gross interest expense, ie net interest income.The IOER thus represents just 2% of the total earned on the spread between its balance sheets assets and liabilities. It would lose just 3% of JP Morgan’s $30,000 million pre-tax profit in 2014. So why does the Fed bother to pay it? Apparently, the reason is that without paying IOER the Fed would “lose control” of market interest rates. 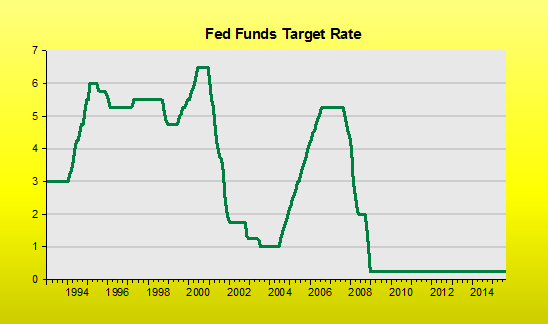 When it set the effective funds rate at 15 basis points it wants it to stick, fair enough, as far as it goes. But if they are also doing massive QE then there will also be a lot of extra liquidity, especially at first. This excess money has to come back to the Fed as excess reserves, sure, all the new cash has to end up back with the banks. And if the Fed didn’t pay the 25 basis points as a minimum then, quel horreur, the excess cash in the system would be expected to force market rates below 15 basis points and the Fed’s rates structure would therefore be unsustainable. What the sophisticates don’t spot is that this situation proves that the Fed’s rate is the wrong rate. The market rate should be allowed to go much lower if it wanted. The standout feature for Fed interest rates over the last twenty years is the Zero Lower Bound, and its artificiality. So why doesn’t the Fed let QE do it’s work quickly, lowering market rates to wherever they settle, getting out of the way and letting the new cash work its “hot potato” magic? Well, it doesn’t like the market running things. The Fed knows best and 15 basis points of effective rates is the right level. Official. Isn’t QE being self-defeated, or at least seriously self-limited, by the Fed itself preventing the free market from working? Yes, broadly. It’s a deeply interventionist, anti-market approach by the Fed. All it’s so-called extra liquidity is mopped by the Fed itself. Sterilised. Wasted. We’ll never know what might have happened if the Fed hadn’t started paying IOER at the start of the crisis. It sure wasn’t smart if they were trying to reflate the economy. The Fed needed to credibly persuade the markets that it wanted to inflate, but the message was that it didn’t want to do it that badly, hence the floor on market rates. And we had the slowest recovery on record. There may also be a fear of what market-determined rates in a QE environment might do to bank and customer behaviour. But is this right? In 2014 JPM’s 10K also shows it held an average of $372 billion of interest free deposits in the US on which it cannot easily charge negative rates, though it could. It had in the US $625 billion of interest-bearing deposits earning the depositors an average of just 13 basis points. It could go to zero on these, or even negative also. In Europe, a number of countries have moved to negative deposit rates without huge problems. There may be a limit before depositors start hoard cash rather than seeing their bank deposits fall in nominal value via negative interest rate deductions. Andy Haldane recently proposed abolishing cash altogether as one way around this problem. That really would be another wonderful victory for interventionism, following one freedom-limiting policy with another. The one benefit that even sterilised QE might have had was to bring down longer term interest rates as it bought longer term bonds, especially mortgage backed securities. Even here it was going about its work in a self-defeating way as a successful reflation would have added upward pressure on longer term bond yields. Fortunately the Fed also adopted forward guidance and said it won’t raise rates until various triggers have been met, or until some constantly moving point of time in the future is reached. This forward guidance has arguably underwritten the economy and allowed the steady, but unspectacular recovery. Unfortunately, the inflation target of 2% has morphed into a ceiling and become a cap on recovery, and is becoming a trap, especially as the Fed’s definition of full employment has been met several times now. It has got around this problem until recently by continually moving the target down. Ultimately, the question of what would JPM do if it got zero IOER is not that interesting. Although on balance it would probably seek a higher return from other securities, driving their prices up and their yields down. It might seek to lower the interest paid on interest-bearing deposits. On balance, some of those depositors might seek alternative places to earn a return. However, it is not obvious that either JPM or its lowly-rewarded interest earning depositors would be that minded to move their money elsewhere while the Fed is so clear in having a 2% inflation ceiling, and being willing to put rates up if the current 1% inflation rates began to move towards 2%. Zero IOER with hawkish guidance may still have been just as self-defeating, or self-limiting, as 25 basis points of IOER. This aversion to lowering either party’s demand for money tells us that through its hawkishness Fed will fail in its responsibility to maintain stable prices. Inflation will keep on falling, or hovering around 0%. Perhaps the Fed’s mission of “stable prices” means zero inflation? Or worse, it means an average of zero. Eventually, a shock will come along, perhaps even caused by the Fed itself and its constant creation of uncertainty. The US government will probably then force the Fed in some explicit or more likely implicit move towards the correct policy of NGDP Forecast Targeting, or at least flexibly (higher) inflation targeting. And history will probably judge the whole QE episode as a massive, but hugely controversial, sideshow. Oh, and the Fed will then probably abolish IOER, too. This entry was tagged Frances Coppola, IOER, James Alexander. Bookmark the permalink. You see, inflation above 1.5% would be the apocalypse….you would not like to see the 1990s again, would you? The assumption is that IOER is a better risk-adjusted return for the banks than lending the cash to the public. What I can’t understand is why banks don’t charge customers more and increase the return? With regard to lending in particular, we continually hear of an imbalance between the supply of loans and the demand. Why don’t banks charge an extra 1-2% interest to sweeten the pot? It makes you wonder just how low rates would be in a market-driven world. I tend to agree with the sophisticates that banks are stopped from lending by the reserves they hold. It isn’t an either/or choice. They just don’t think they can make the risk-adjusted returns on the loans in the current economic environment. The problem is the economic environment (ie lack of aggregate demand), not their lack of funds. They can’t charge borrowers more as all banks are essentially price-takers and the market sets the price. There is plenty of liquidity chasing relatively few good return opportunities. The small business lobby are always complaining about lack of finance, most need equity finance not debt finance. Things go wrong for banks when they can’t see the difference either. Thanks James. I don’t know why banks are price takers. While I agree that weak aggregate demand is the main culprit, it feels a little bit circular. I’m thinking of residential real estate sector in particular which has been fairly stagnant despite prices and interest rates that should elicit demand. Supply is contrained because here needs to be more spread and in my view artificially high short-term rates are inhibiting the spread and also stifling aggregate demand. How do you know this? Why wouldn’t they just substitute into Treasuries? Or possibly even into riskier assets? Is that what you want…for the banks to hold riskier portfolios? I thought we all wanted safe, run-proof banks? Losing $825m is just a first round effect, other things being equal. Of course, you are right, things are never equal. Evasive action will be taken. I was merely pointing out that for starters 2% of pre-tax profits is a drop in the ocean for JPM, and likewise for all banks. The net lost income could well be much smaller. JPM may well buy Treasuries but the second round impact might well reduce yields there. Third round impacts might be the Fisher effect as the hot potato effect starts up and reinflation begins, leading to less demand for ultra-safe assets at ultra-low rates. “We” don’t all want safe, run-proof banks or we’d get no interest on our deposits and savings. Banks have to take risk to get a return, to their shareholders and the people who fund their balance sheet – you and me. Individual banks have runs because they get the risk/reward trade off hugely wrong, through taking too much credit, market or other sort of risk. When all or most banks in a currency area have runs it is due to woeful monetary management at the central bank, or serious government macro failures. Do you think, at least initially during the Financial Crisis, IOER was also used as a mechanism to, at the margin, help re-capitalize banks in a risk-free (to the banks) manner? It may have been a factor but a minor one. Just more liquidity was what really helped. Scott Sumner often cites a quote from Bernanke at the time saying IOER when was first introduced to sterilise the liquidity increases in case they impacted monetary policy. No, that’s not a bad joke. I hadn’t realized how low inflation has been. Just pulled up the Y/Y % change on the PCE index. Inflation by this measure hasn’t broken 2% since April 2012! How is any sane person advocating higher rates! ?